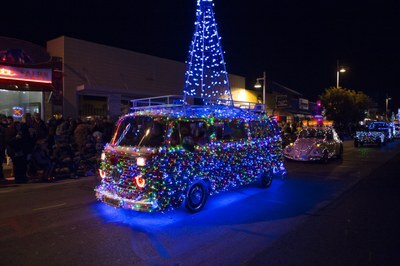 ALBUQUERQUE, NM - Dancing elves, prancing horses, marching Knights and, of course, Jolly Ol&apos; St. Nick will be just a few attractions to see during the City of Albuquerque&apos;s Twinkle Light Parade on Saturday, Dec. 2. The parade is returning to Nob Hill and will follow its usual path on Central Ave. beginning at Washington St. traveling west to Girard Blvd. The parade begins at 5:15 p.m. This holiday tradition is a spectacular family-friendly event featuring dozens of floats, marching bands, equestrian clubs, fire trucks, car clubs, organizations, and businesses. Parade organizers and more than 100 participants - comprised of 3,500-plus individuals - promise to dazzle spectators by bringing the sparkle, the glimmer and the twinkle to a new level this year. Parade participants will be judged in various categories ranging from walking groups to show cars and community to commercial. While strolling through Nob Hill, be sure to get a jump start on Christmas shopping by stopping in the unique shops and galleries, or grab a bite to eat at various restaurants in and around the area. Beginning at 3 p.m., free parking will be available at the southwest lot located on the corner of Lomas Blvd. and University Blvd. Buses will run from the lot to Johnson Field throughout the parade. The last Park & Ride bus will leave at 10 p.m.